Today I’m posting one my favorite comforting soup made with raw mango pulp. 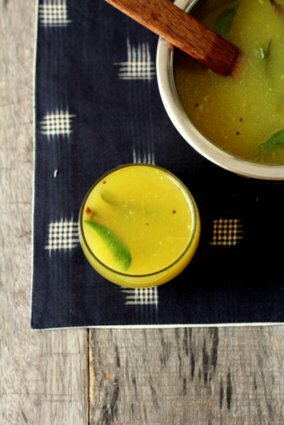 Mango rasam! Light on the stomach, easy to make and absolutely flavorful. In many telugu speaking households you will find homecooks whipping up a variety of raw mango recipes other than the famed avakai (mango pickle) and its likes including pachadi, pulusu, pappu (dal), curry and rasam. Down South, in Tamil Nadu, Andhra and Karnataka especially in the Mangalore region, mango rasam is prepared during the mango season. Appe huli (mango rasam) is a traditional Mangalorean delicacy served at weddings and special occasions. Mango rasam is called maavina saar or saaru in kannada, mamidikaya chaaru in telugu and pacha manga rasam or mangai rasam in tamil. With minimal ingredients yet high on flavor, mango rasam preparation is almost similar across all regions with slight variations in terms of tempering and the use of rasam powder. 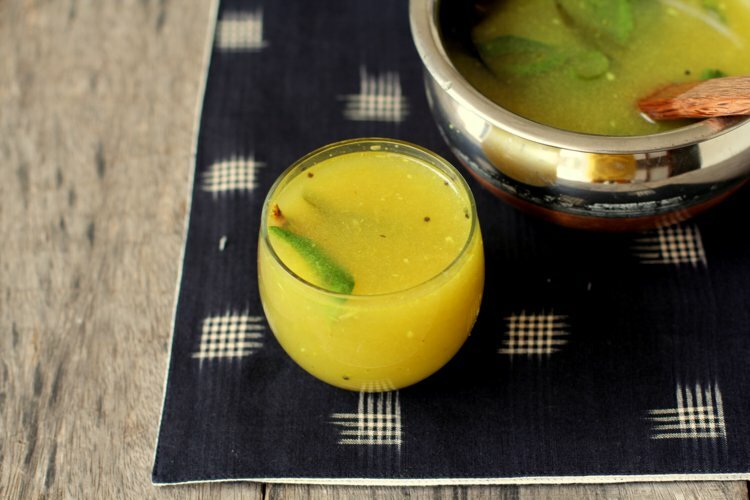 This particular mango rasam recipe does not call for the use of rasam podi. With summer bringing in a bountiful harvest of mangoes and the fact that raw mango is rich in vitamin C, B vitamins, antioxidants and aids digestion, it should be included in one’s diet. 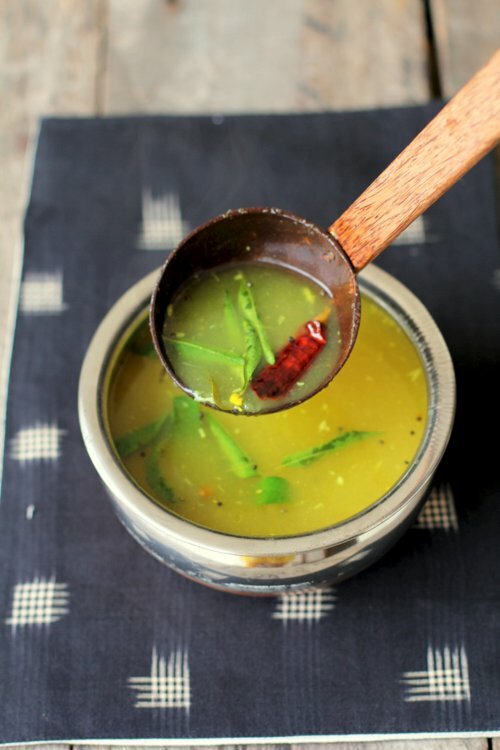 Mango rasam makes for a wonderful change from the regular everyday rasam. The key is to use a green mango that is almost beginning to ripen. It will have a slightly more sweet flavor which is ideal for making raw mango rasam recipe. The touch of spice and jaggery to the tangy mango broth give it a delicious tropical flavor. Though traditionally, mango rasam is served with rice, it can also be served as a vibrant soup and makes for a wonderful vegetarian party appetizer. 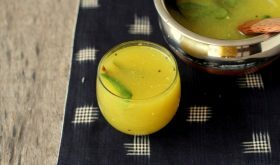 Definitely one of the best mango rasam out there and if you are looking for raw mango recipes that are easy and flavorful, I’d recommend you bookmark this authentic South Indian rasam recipe that’s vegan too. In a vessel, add 1 1/2 cups of water, turmeric, one green chili, salt and the raw mango pieces. Bring to a boil and simmer with lid. Cook till the mango pieces turn soft. Allow to come to room temperature. Once cool, grind the mixture to a fine paste or mash with a ladle. In another vessel, add the ground mango paste and enough water (approx 3-4 cups) and mix well. It should be of watery consistency. Add jaggery or sugar and bring to a boil. Simmer for 7-8 mts. While the mango rasam is simmering, prepare the tempering. In a small pan, add oil. Once the oil turns hot, add mustard seeds and allow to splutter. Add urad dal and allow the dal to turn red. Finally add curry leaves and asafoetida. Turn off flame and pour the tempering into the hot mango rasam. Turn off flame and place lid. Allow the flavors to meld for a few minutes and then remove to a serving bowl. Serve warm with white rice or serve as a warm soup. 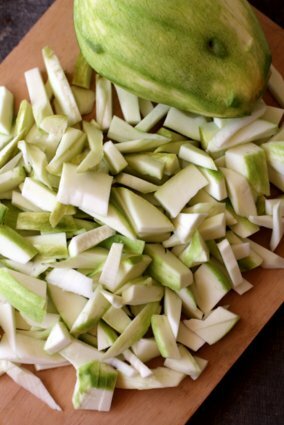 You can pressure cook the whole green mango along with skin in a cup water and pressure cook till soft. Once cool, you can extract the juice and discard the peel. Tempering can be done in ghee or oil. You can add a tsp of rasam powder while the rasam is simmering. You can add 1/3 cup of mashed yellow moong dal for a variation. By Sailu Published: July 16, 2015 Mango rasam, a South Indian style soup made with raw mango pulp & spices. A special dish among mango recipes also called as appe huli, saaru, charu or saar. It is a very good recipe & I hope to try soon. I am originally from Bangalore & now living in California. Hope to see many more vegetarian recipes.